For those who don’t know I used to ride horses back in high school and college. I was actually quite competitive in high school. I leased a horse (Molly) and worked at the barn mucking stalls and taking care of the horses in exchange for lessons. And I frequented jumper competitions (oh how I miss those days!). In college I was just about to join the equestrian team when I tore my ACL skiing (sad face) but I rode for almost two years while in school. When I moved to NYC I looked into riding but finding a decent barn around here has proven to be a challenge. 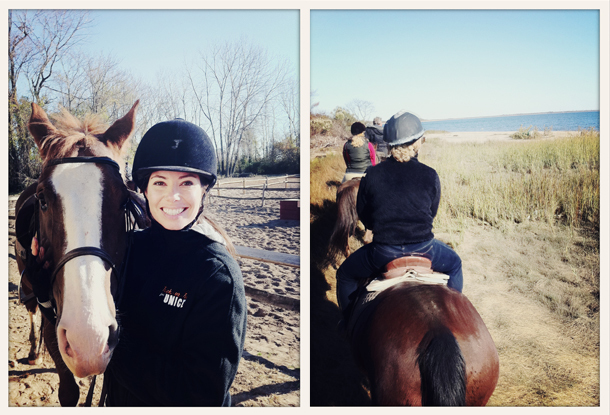 Last weekend I joined some friends out in Brooklyn for a trail ride (where we meandered onto the beach and were free to canter around) and I was immediately reminded how much I love this sport. Decision made, I’m going to start riding again! Just got caught up on the blog. I've been missing reading your posts.